Our week began with a sighting of the Tamboti Female. She was stalking impala in the last light of the day. As she walked closely to us, we could examine the wound she recently sustained. She seemed comfortable walking on the leg and it seems much better than it apparently was last week. We are not sure how she was injured, but are happy she is on the mend. 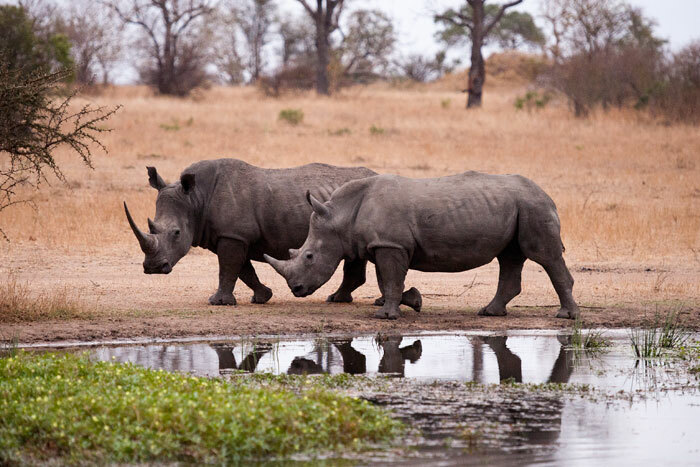 Two White rhino pass by Circuit Pan. They were females being pursued by a territorial male who chased them away from their afternoon drink! One of the highlights of being back is seeing these new Sparta cubs for the first time. The two little ones are curious and playful. We came across them one afternoon just as they were waking up, keen to cause trouble. 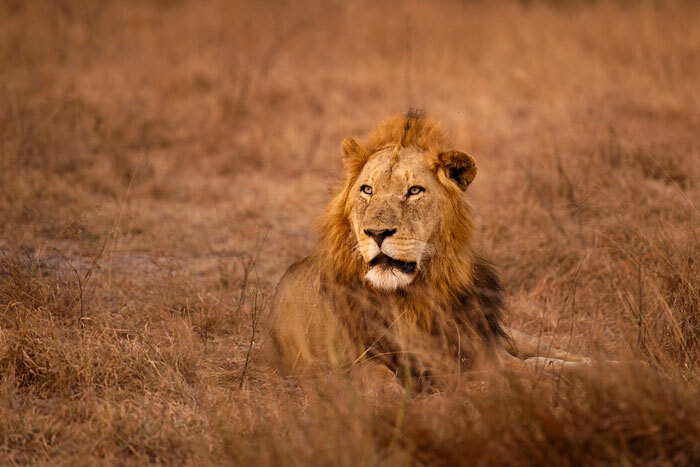 There are four lionesses in the Sparta Pride now – this one being the older pale lioness and it would seem the only one who doesn’t currently have cubs. 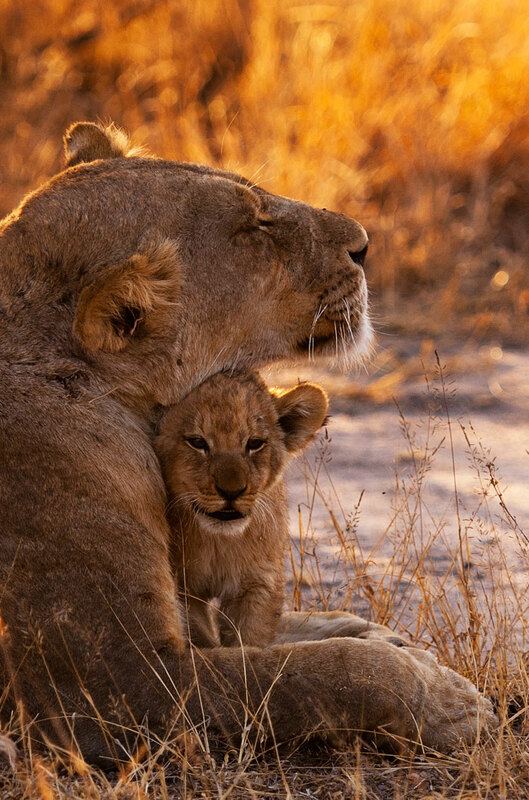 She was with her daughter (the mother of the two youngsters) and other younger lioness who still has the 3 6-month old cubs. 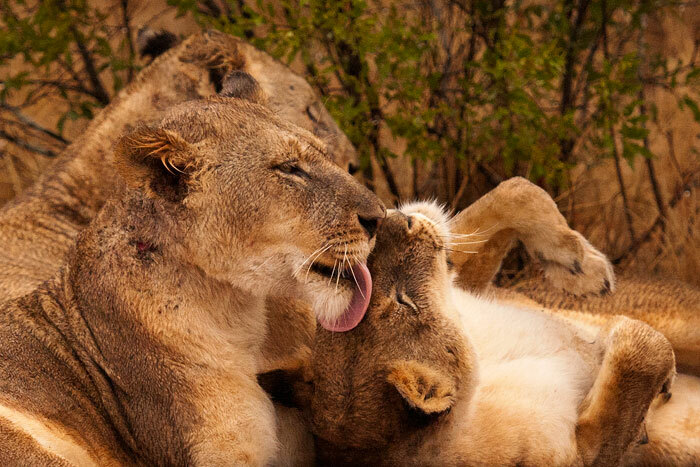 The fourth lioness was not present – presumably at her densite feeding her own cubs, which are still hidden. 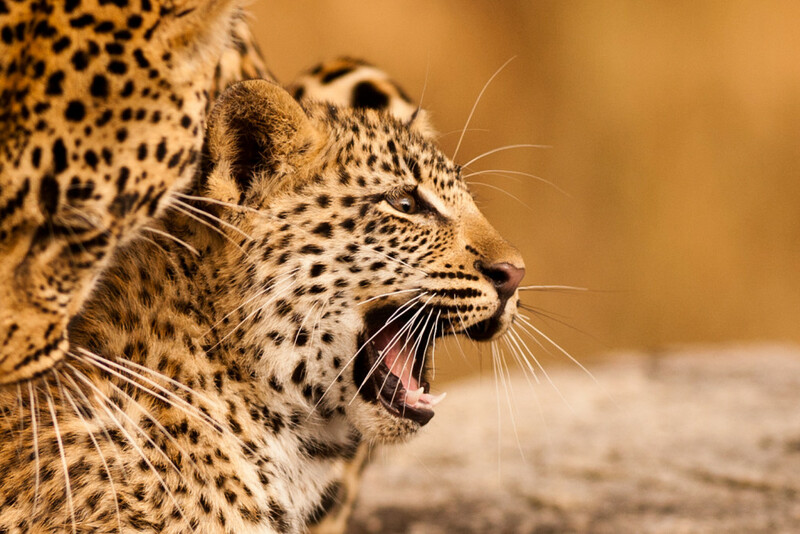 As they woke up, the little cubs stretched, showing their already-dangerous looking claws! 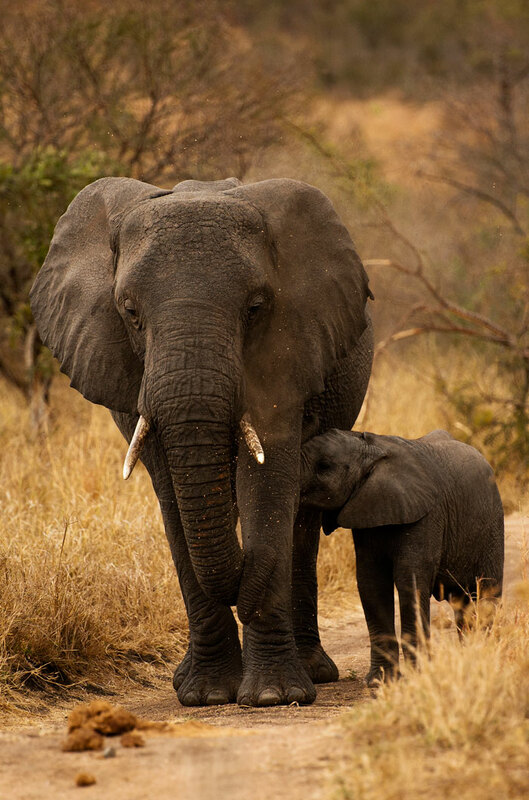 They greeted their mother warmly, who nursed them before hunting. 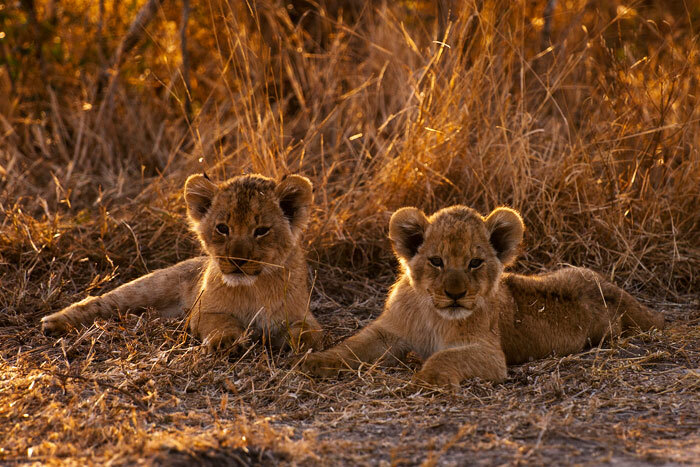 That night, they left the cubs hidden nearby while they unsuccessfully hunted. Sometimes the most amazing sightings are right in camp! One afternoon, all of the vehicles were loaded up and ready to go, but we all sat and watched these two Nyala bulls displaying on the Varty Camp lawn. The one in the foreground eventually became submissive and wandered away without a fight. It seems that there are youngsters everywhere! 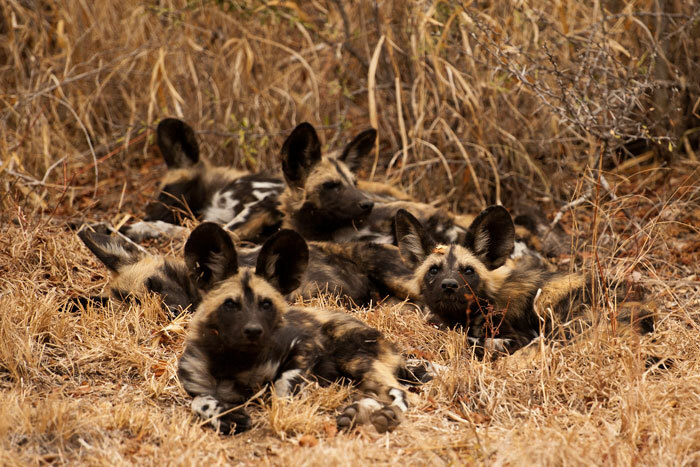 The Wild dog pack make a return to Londolozi this week, with their six new pups. After a long track one morning we found them nestled together in a thicket. 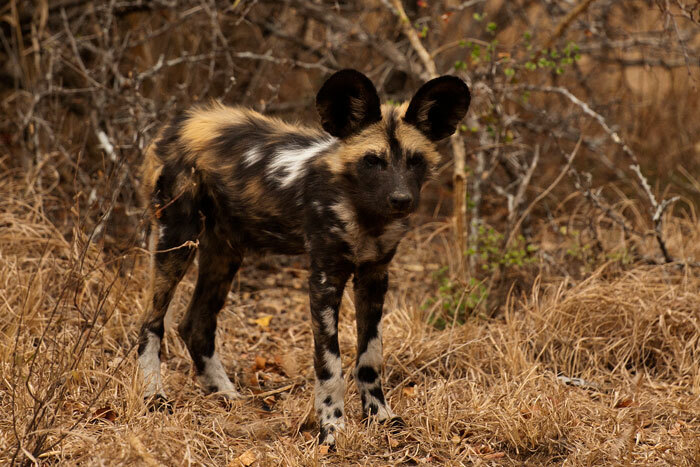 At about 4 months old, the pups come from two different litters, which is interesting for WIld dogs as it’s usually only the alpha female who breeds. 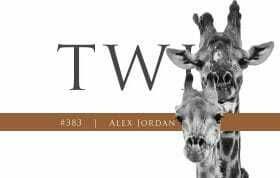 In this case, both the alpha and sub-alpha female had litters this year. 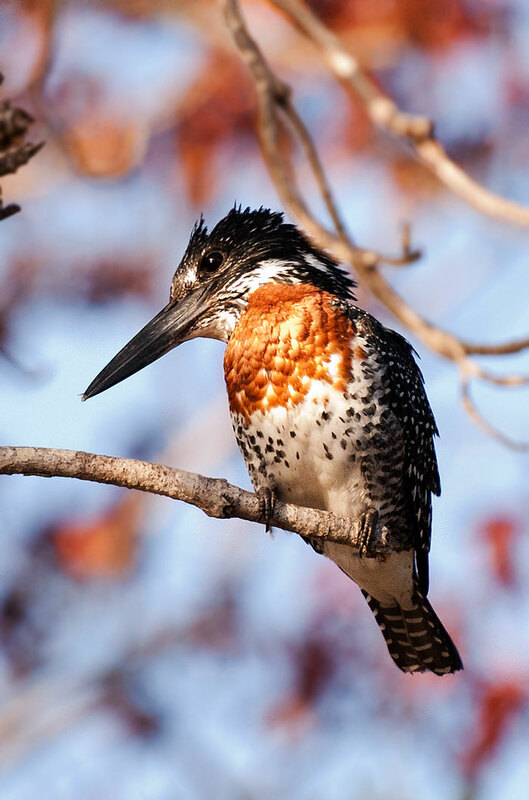 A Giant kingfisher waits for prey at Taylor’s Crossing. 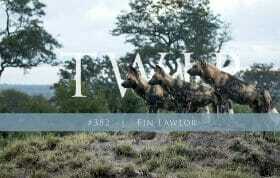 Our first visit to the ‘new’ hyena densite in the deep south of Londolozi was not disappointing! This was one of about six very curious youngsters who ventured out to investigate. The mother didn’t seem terribly impressed by their antics, however, and kept trying to carry them back to their den! 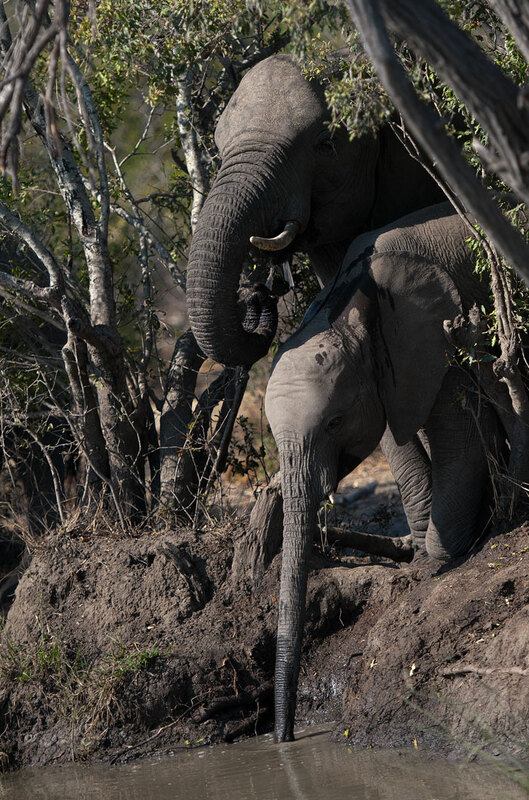 Two elephants squeeze into a small gap to reach the water for a late morning drink. 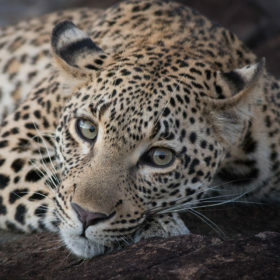 A Majingalane Male awakens with a jolt one afternoon upon hearing a rustling nearby. It was only the wind picking up, so he went back to his slumber shortly afterwards! The four big males have been found in some different areas this week, perhaps exploring more of their huge territory. 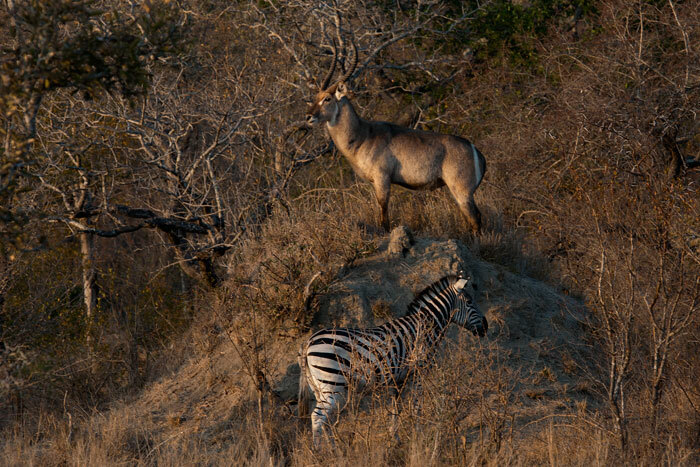 A male waterbuck stands atop a termite mound, proudly displaying his large stature to potential rivals, while a zebra looks to graze beneath. Finding this little guy was a definite highlight this week! Upon spotting the tracks of where a female leopard had dragged a duiker across the road, we set out on foot to try to find her. After following the track for about 200m past plenty of suitable hoisting trees, we deduced that she must have been dragging it back to a youngster. 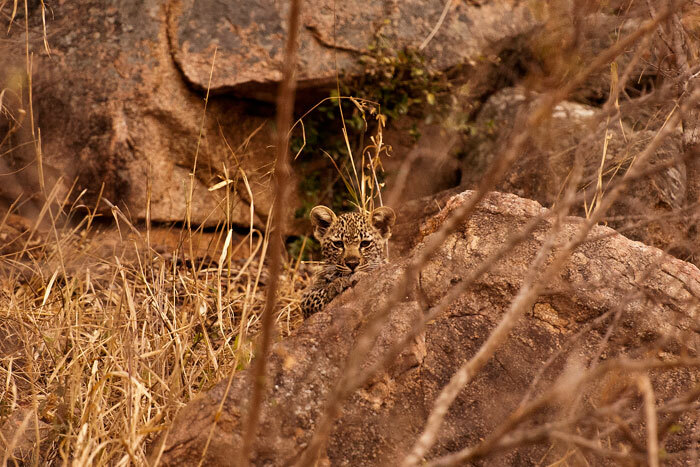 Freddy stayed on the track for about 2 kilometers, until we found the Piva Female and her cub in a rocky outcrop. 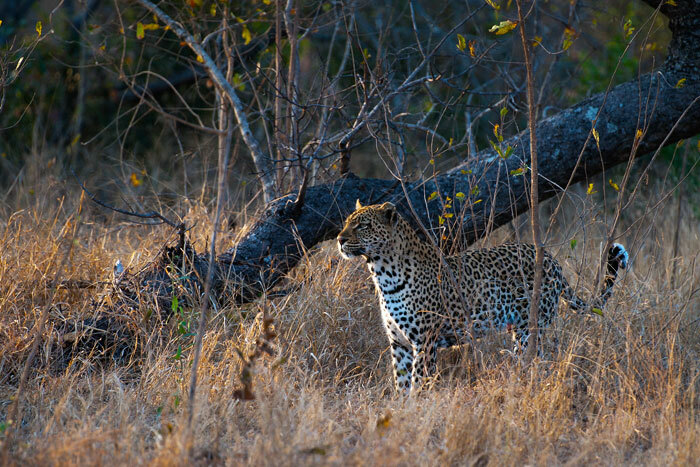 Our ranging team had suspected she was in the area, but this was the first confirmed sighting on Londolozi. The cub actually ran towards the vehicle at first, clearly having been exposed to vehicles on another property. 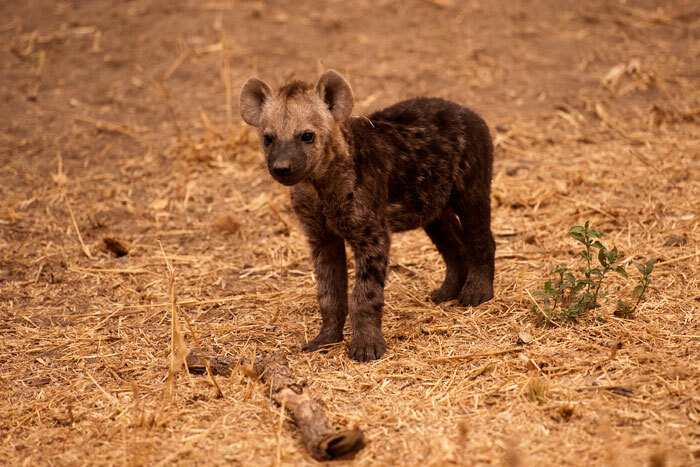 What followed after this photo was taken was an extremely exciting encounter between the mother and a hyena, trying its luck for the scraps. 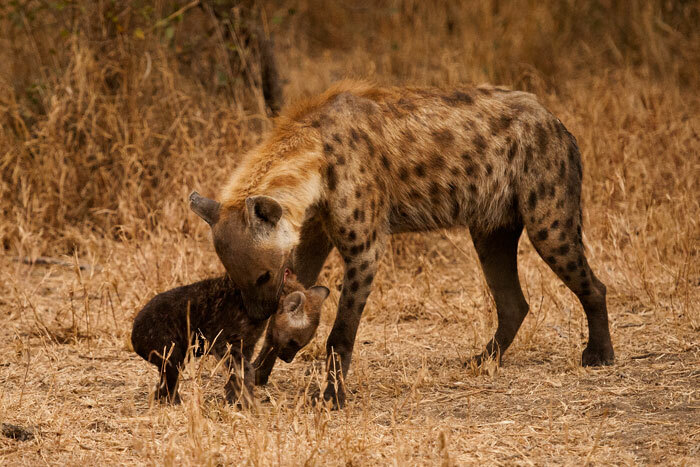 The cub ran to safety while the mother actually chased the hyena away! 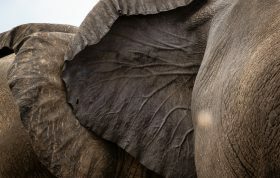 There have been many elephants around Londolozi this week. Here, a cow gives herself a dustbath while her calf nurses. 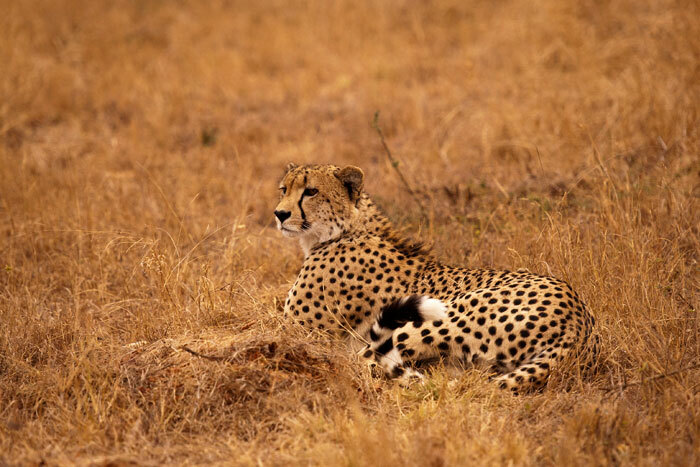 As the clouds were building towards the end of the week, we came across the male cheetah one afternoon. Because of the high winds from the approaching front, he was rather nervous as he tried to take his mid-afternoon nap. We watched him as he scoured the area for prey, amongst the leadwood tree skeletons. Thinking these bare branches are concealing him, an elephant calf investigates us. We had a few sightings of the Sparta lionesses this week, and despite the cubs not being around, this was probably my favourite. We stumbled upon the 3 lionesses deep in a thicket whilst following the Tamboti Female leopard, on a very rainy morning. Despite the weather and slim chances of finding them, we watched them hunt and then groom one another. Very unseasonably, the rain continued for 3 straight days this week! Regardless our game viewing was outstanding. 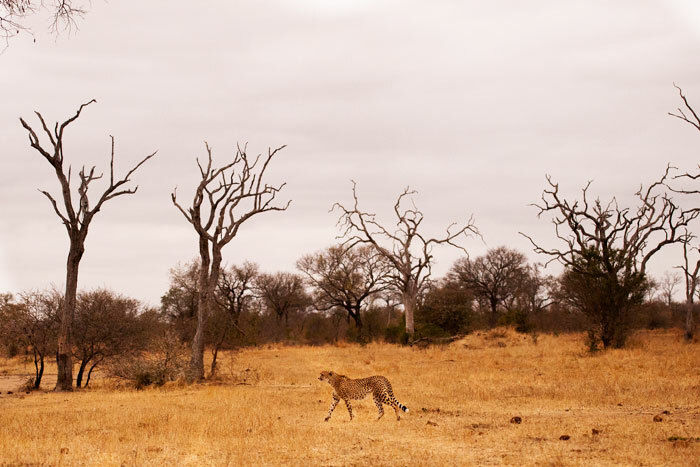 We found the cheetah again – this time right next to camp, and with an impala kill he had made moments earlier. 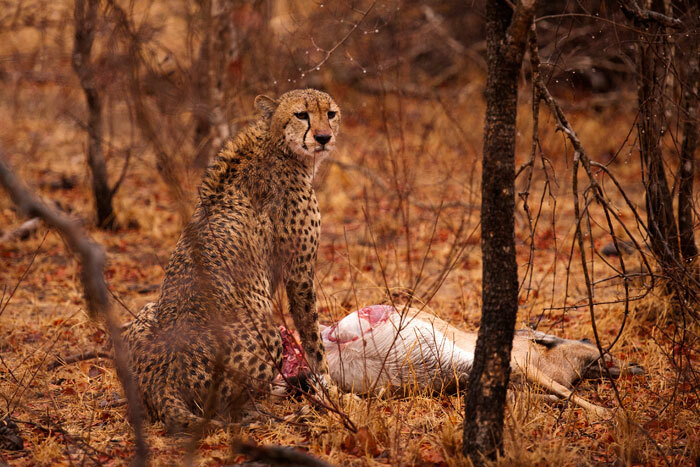 He managed to get his fill but the following morning, the Marthly Male leopard was found with the remains of the kill, clearly having robbed the cheetah of it. 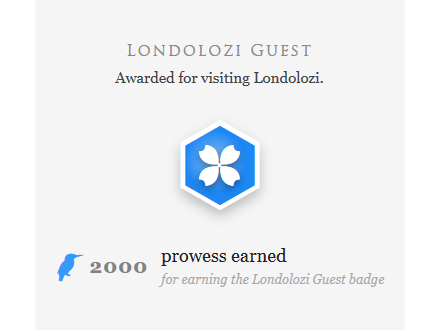 What a fabulous week to be at Londolozi! 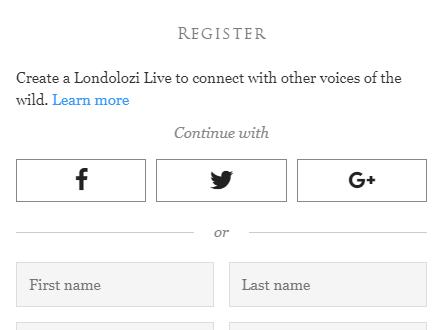 Any week at Londolozi would be wonderful. It’s been a year since I was there and I miss it every day. Thanks Talley for keeping the memories alive. 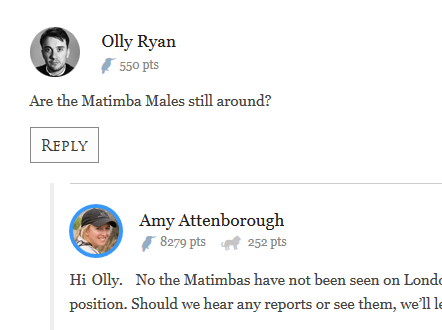 The photo of the Nyala bulls is a hit. They look like ritual dancers. 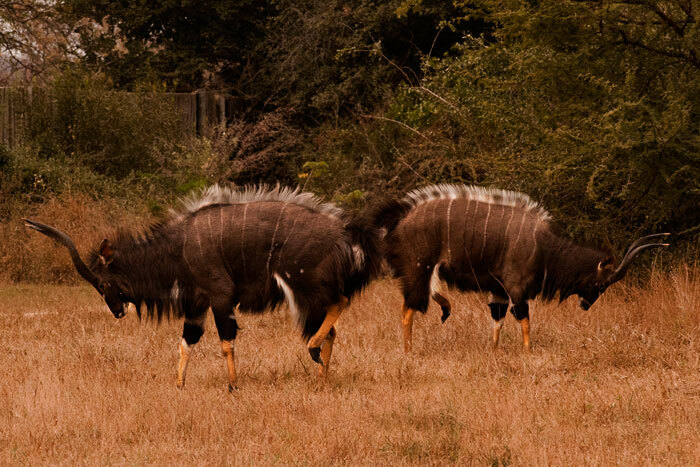 Splendid antelopes. get the gold medal from this household! 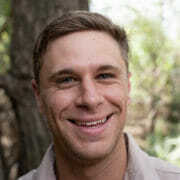 I’m glad that he’s doing Okay, it’s the only in londolozi. 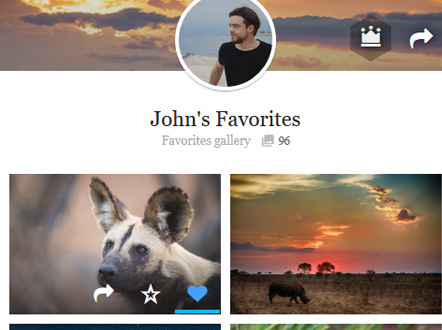 All great photos, Tal – I love the Kingfisher shot! 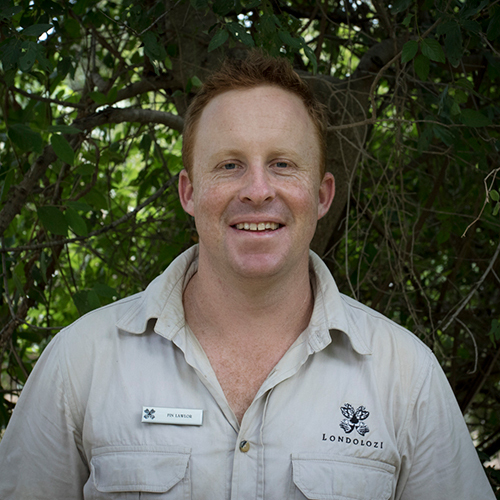 Welcome home & thank you for another beautiful week in Londolozi. 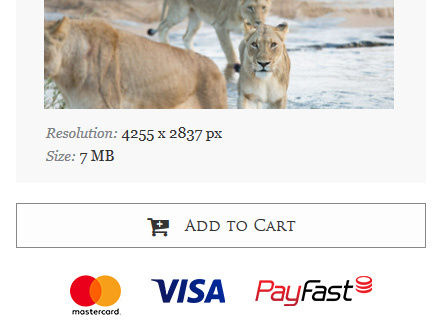 Glad to have you back, I look forward to your weeks in pictures (although enjoyed the year in a half as well…ha,ha), I can’t wait to get back to Londolozi, I’ll be booking my return in the next month or so. 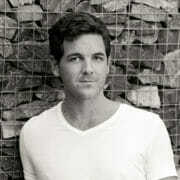 In the meantime I’ll depend on you to keep us abreast of all the adventures we are missing. Welcome back Talley! What a way to start out, magnificent pictures.. young ones everywhere! 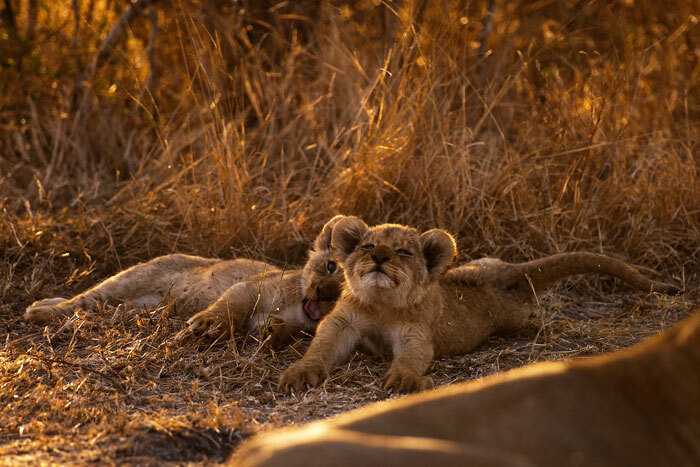 I love the lion cub stretching looking so pleased. 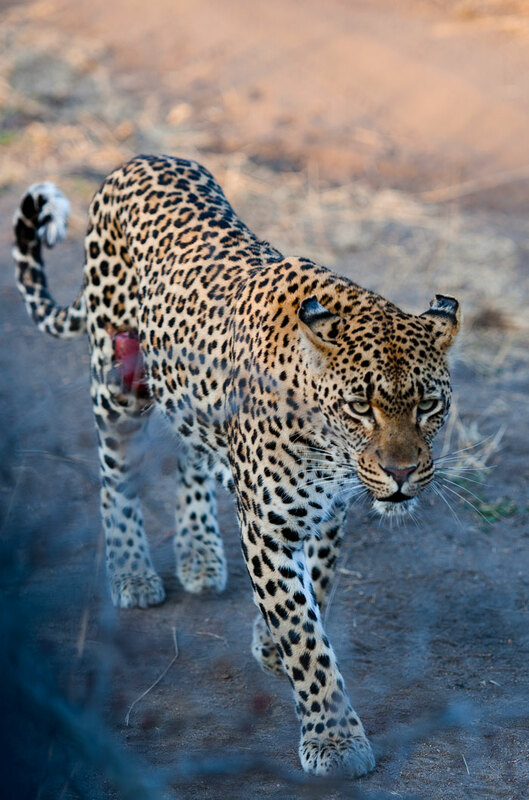 Tamboti female is looking great in spite of her wound. thank you for giving us a peek into your beautiful world. Welcome back Talley!!! Always one of my favorite Friday afternoon (here in the States) activities is to review your week in pictures. And your efforts were fantastic! As always, I can imagine myself sitting in the truck viewing your sightings even from far away here in Philadelphia! Thank you! Wonderful pictures as always. 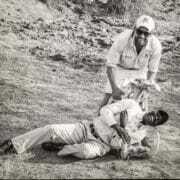 It tells a lot of wat is hapening there. Thank you very much for the update. Leave it to Freddy to find the ‘hidden’…..he’s absolutely amazing! 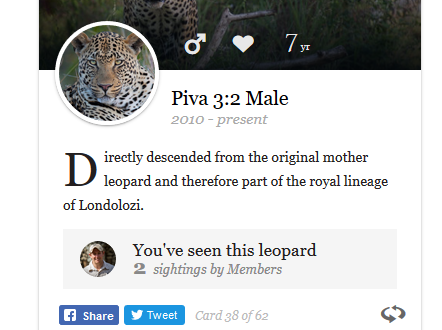 Is the Piva female known by a different name, cant recall hearing about this leopard before? Some fantastic shots Tal, although I do resent the ‘year-and-a-half’ in pictures chirp! It was only a year and a quarter! Haha. But seriously, it’s good to have you back. 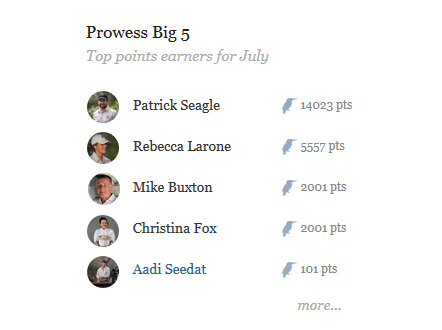 Even though I live and work here, your Friday post is a big highlight of my week! Thanks so much Talley! Wonderful as always, especially loved that cub stretching. 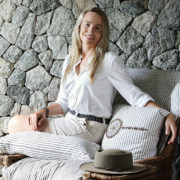 Fantastic pics Tals, great to have you back in the bush and taking such wonderful pics. 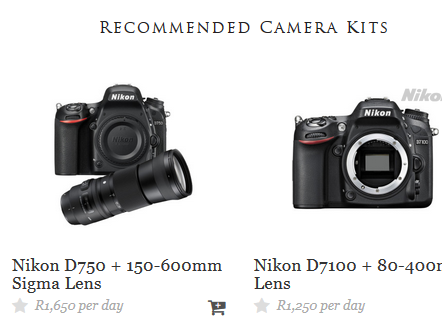 That new lens is superb! Great Pics Tal, makes me very homesick! LOVE the one of the Giant Kingfisher. Fantastic shots! Some of the best yet. I honestly can’t decide which is my favorite. 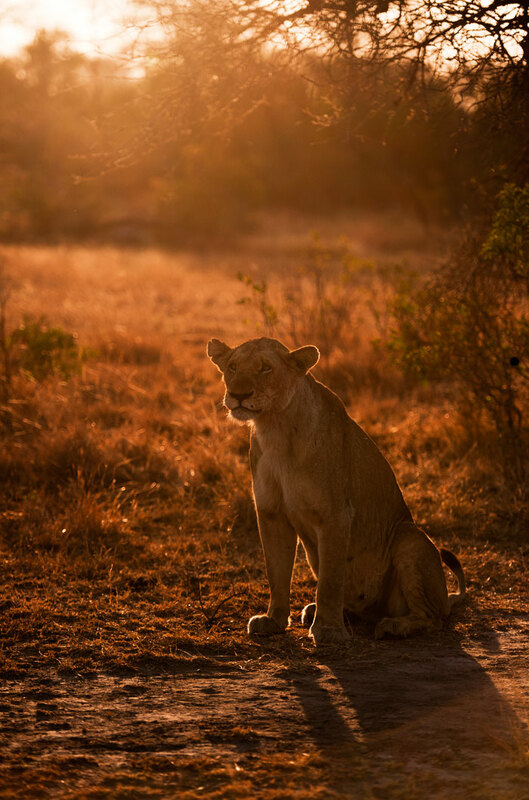 The light for the lone pale lioness is just gorgeous. I love how you can see her tattered ear and aging face. 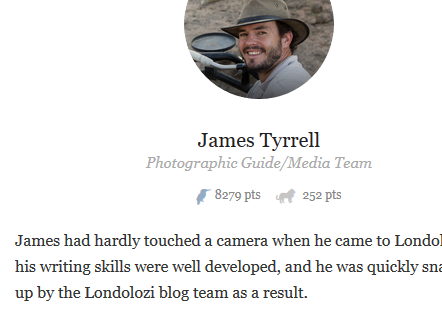 Ugh, your weekly updates make me miss Londolozi like crazy. I can’t wait to come back! Everyone is thrilled to see this week in Pictures but we miss you in Bermuda! Guess we better come see you soon! 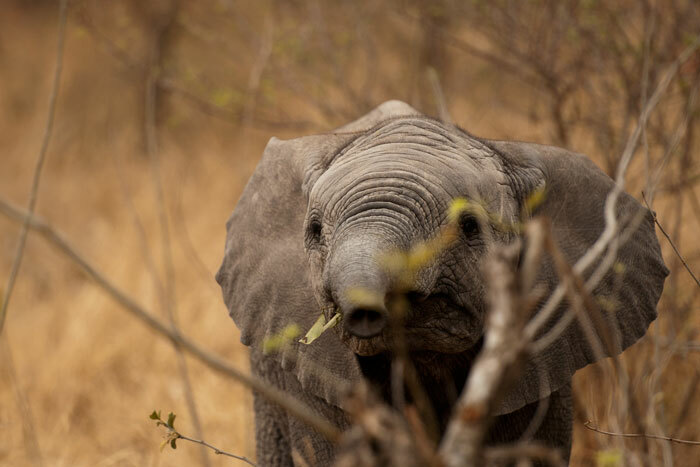 Thanks for another great week of photos , especially the baby elephant “hidden” in the branches!